The No. 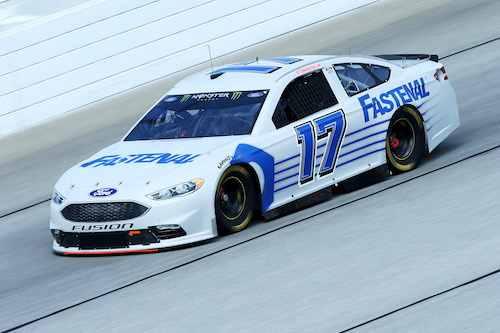 17 Roush Fenway Racing Ford of Ricky Stenhouse Jr. during a test at Chicagoland Speedway on Aug. 15, 2017 (photo courtesy of Getty Images for NASCAR). Wednesday is the second day of a two-day Monster Energy NASCAR Cup Series test at Chicagoland Speedway in Joliet, Ill., to help teams prepare for the Sept. 17 race at the track, the first race of the 10-race, 16-driver playoffs. Cup organizations were each allowed one driver/team at the test. Furniture Row Racing, though, opted out of the test. FRR driver Martin Truex Jr. is the series leader in wins (four) and playoff points (35), heading into Saturday’s Bass Pro Shops NRA Night Race at Bristol (Ten.) Motor Speedway. Truex also is expected to be the recipient of the regular-season bonus of 15 additional playoff points. He may clinch that bonus at Bristol. Counting the Bristol race, three races remain in the regular season. The 10 drivers/teams participating in the test at Chicagoland test include Austin Dillon of Richard Childress Racing, Jamie McMurray of Chip Ganassi Racing, Ty Dillon of Germain Racing, Matt Kenseth of Joe Gibbs Racing, Jimmie Johnson of Hendrick Motorsports, Brad Keselowski of Team Penske, Ricky Stenhouse Jr. of Roush Fenway Racing, Aric Almirola of Richard Petty Motorsports, Kurt Busch of Stewart-Haas Racing and Ryan Blaney of Wood Brothers Racing. All three manufacturers each have an additional car participating in the test. Front Row Motorsports’ David Ragan is driving the Ford. The other two manufacturers have drivers not regularly competing in the series in 2017 in their extra cars, with Alex Bowman in a Chevrolet and Drew Herring in a Toyota.